DIY Flocked Christmas Tree: One Year Later. - Lovely Etc. You are here: Home / Christmas / DIY Flocked Christmas Tree: One Year Later. I love a beautiful Christmas tree. And I think snowy white flocked Christmas trees are the most beautiful Christmas trees of all. Last year I got brave and flocked my own tree. And it turned out sooo beautiful. 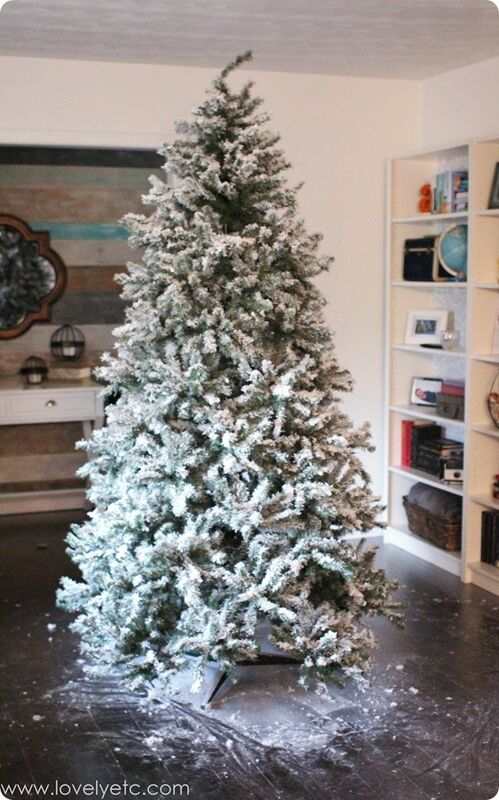 For those that don’t know, flocked Christmas trees are those beautiful snowy trees. Not the trees with white plastic needles, the ones that look like they have snow crystals all over them. They can be all white or they can have just a ‘dusting’ of snow, but either way they are gorgeous. I wanted one of those beautiful trees so bad, but I couldn’t justify buying a whole new (expensive) tree when I had a perfectly good artificial tree already. So I did what I always do in those situations – I figured out how to get what I wanted by doing it myself for way less. And it worked! If you haven’t read about my flocking process, you can check out the full tutorial here. But suffice it to say, my DIY flocked Christmas tree looked amazing. The flocking made the whole tree look fuller, more realistic, and more beautiful. Over the last few weeks, I’ve gotten tons of questions about my tree and how it is holding up. So today I am going to share the good, the bad, and the ugly of flocking your Christmas tree. Where did you get the flocking? Lots of people have asked where I got the flocking I used and while I updated my original post to include this information, I am going to include it here too for those who missed it. 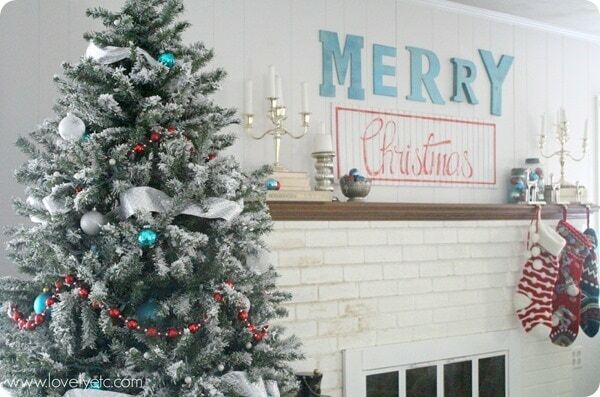 There are several ways to get a gorgeous flocked tree. You can buy one that is already flocked. You can have your tree flocked at some Christmas tree lots or florists. Or you can do it yourself like I did. Most professional flockers use a fancy machine to spray the ‘snow’ on but you can do it yourself without one of those. Last year, when I decided to flock my tree, I looked into all kinds of ways to get a pretty snowy tree. Some people use spray snow or white paint. Some people stick cotton batting in their tree or make their own flocking mixture with glue and glitter and paint. All of these could be great options, but I couldn’t find a single picture of a tree that truly looked snowy that wasn’t done with proper flocking. So I decided to get the real stuff. I did my research and purchased a five pound box of Sno Flock from Amazon. This is the good stuff and I can personally vouch for it. Last year, I used roughly half of a 5 lb box to lightly flock my 7.5 foot tree. To be honest it is pretty messy. Verging on really messy. 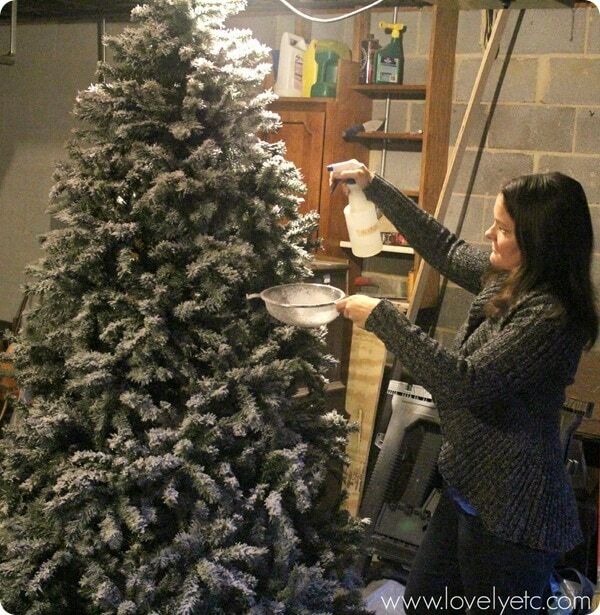 The process of flocking the tree is quite messy and I would definitely recommend doing it outside or in a basement or garage where a bit of mess isn’t such a problem. 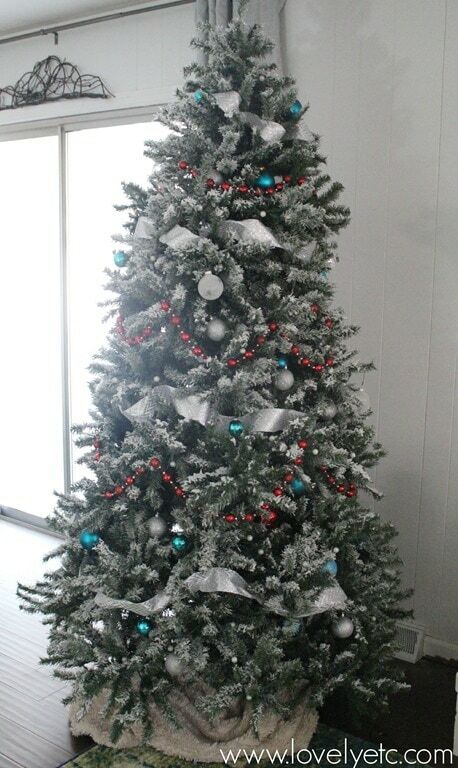 Damp flocking will stick to the both you and the floor as you are flocking your tree. It isn’t a big deal to clean up though. Just throw your clothes in the laundry and use a stiff broom to scrape up the flocking on the floor. Unfortunately, it continues to be messy any time you move the tree including when you move it into the house, when you decorate it, when you jostle branches, etc. The flocking will flake off and land on the floor. But since it is now dry, it will basically be like white dust falling off the tree. 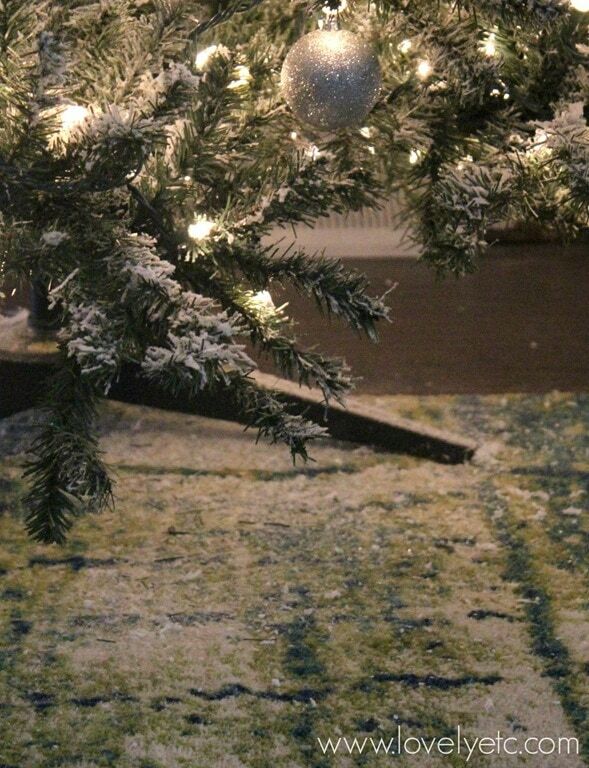 It is very easy to clean up with a broom or vacuum and once the tree is decorated and just hanging out in the corner, it will stay fairly neat. As I mentioned, the tree does shed some of its snow whenever it is moved or jostled so it will gradually become less and less snowy. We are very fortunate to have a large basement so for the last few years, we have moved our entire tree to the basement without disassembling it. (We did this even before I flocked the tree.) This is the best time saver ever and if you have extra room in your basement, garage, closets, etc. I highly recommend it. We just throw some old sheets over our tree to keep the dust off and then bring it back upstairs the next winter. Because of this, I cant say for sure how much snow would be lost in disassembling and reassembling the tree each year. I would imagine quite a lot – maybe half, maybe a little more. I doubt all of the snow would fall off though. And what did fall off, could be easily cleaned up as you pack away the tree. Even without packing our tree into a tiny box, we did lose some snow between decorating it, undecorating it, and then moving it to the basement. I would say we lost 1/4 to 1/3 of the flocking I had originally added. Obviously these two pictures aren’t showing the exact same branch, but you get the idea. After a year of use and then storage, it was looking a little ragged. So this year before I brought it back upstairs, I added more. I still had plenty of flocking powder left over from last year so I pulled it back out and added more all over the tree and I still have maybe 1/4 of the 5 lb box left. Adding extra flocking probably took 30 – 45 minutes. As you can see, I added more flocking this time than I did originally. I wanted it to look even snowier, plus I knew that some of the snow was going to fall off. This time, I got a tip from the sellers of the flock to add a little white school glue to my water to help it stick better so I tried that. So far I can’t really tell if it helped the flocking stick better. This is the mess that was created putting on the lights this year. (I sadly didn’t realize I should have just left the lights on when I undecorated last year until it was too late!) I love Christmas lights so there are seven strands of lights on there wrapped around each individual branch. If you just add a string or two, the mess will not be nearly this big. Also, this mess was definitely helped by my two year old who thought shaking the tree to watch the snow was really fun. Personally, I would probably skip it if you think your pet may try to eat it. Also, if you are worried about your pet tracking flocking powder all over the house, that could also be a problem. Can you also do this on real trees? You can use this on real or fake trees as well as wreaths, garlands, Christmas villages, etc. It would actually probably stick better to a real tree as their needles are not as smooth and slick as fake ones. Despite the messiness and the fact I needed to refresh my tree this year, it was 100% worth it to me. I think it turned a perfectly ordinary fake tree into an extraordinarily beautiful one. It was easy to do and fairly inexpensive. The mess is kind of a pain but is easy to clean up. And I love the way it looks all beautiful and snowy. I am debating flocking some garland or a wreath this year as well, but that totally depends on time! This photo is of our Christmas decorations from last year. Update: you can see new pictures of the tree all decorated as well as the rest of this year’s Christmas home tour right here. Have any flocking questions that I didn’t answer? Leave them in the comments or email me and I’ll get back to you. I absolutely love your tree!!! I have been looking for a tutorial on flocking for a while now and I am so glad I found yours! I would love to flock my Christmas tree this year! Love the snowy look! Have you chosen the winners yet for your blog post?! I just got on your site for the first time and I am in LOVE. Thank you Sheryl! You are so sweet! I adore your tree! I have been wanting to flick my tree for years but just can’t seem to get to that point. A flocked tree would look so good with my vintage Christmas decor. Thanks for the tut, the update, and the chance to win! Every year we have a real tree for “pretty christmas” and a fake tree (6 ft.) for our childhood and fun ornaments. This was a tradition from my husband’s family, which is awesome, but I don’t love fake trees. I think this would go far to make it look nicer! Thanks for sharing! The tree looks great. Do you know of any Canadian distrubers? Tori, good question. I don’t know of any – I’m sorry! Love the flocked tree because I’ve always wanted one. Thank you for the tutorial. Very easy to follow & all of your tips are helpful. Yes, Sno-Flock can get messy, especially if your artificial tree has very slick branches. The more you spray when you do the application procedure the more it tends to stick. The reason we mention the disclaimer about allergies is that our product is 100% natural, and does contain both tree and corn products. We also have never had a problem with pets, however they are family and should be treated with care and concern; so if anyone’s at all worried about their pets eating Sno-Flock to a large extent, we would advise against its use. 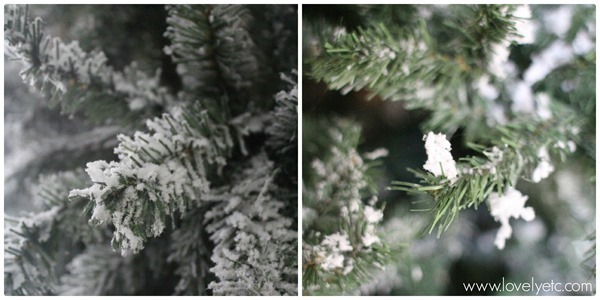 Additionally, there was a fair-bit of Sno-Flock loss on your tree, much more than normal. Generally it could be a result of not enough water was used during application, but you can always contact us and we will be more than glad to help resolve such issues. Good luck to all who register for the giveaway, we are so excited to have Lovelyetc. host this! Merry Christmas everyone! Thanks for chiming in! It is especially good to know that Sno-Flock is all natural. And I’m thinking my toddler had a lot to do with the excessive snow loss – but if I flock again next year, I will add more water and see how that helps. can you remove the flocking the following year if you want to? i really want to flock mine but worried that if i want a plain green tree the following year that i wouldnt be able to remove it? Yes and no. You can hypothetically remove the flocking the next year but it would be a major pain to do so. Even though there is usually some shedding, a lot of the flock sticks to the tree pretty well. You can definitely pull it off with your fingers if you are trying, especially after a year has passed, but to get the tree completely bare again would be incredibly time-consuming. If you just wanted it to be less flocked, that wouldn’t be so difficult though. All in all, if you don’t think you want to keep your tree white, I probably wouldn’t flock it. I totally love that you updated with new information a year later. Really, that is the only way a person can make the right decision, especially since I can’t afford to replace my tree(s) if I wreck them, lol. I decided I’m going to give it a go! Carrie, thank you for all your instructions and comments concerning the Sno-Block. I have always wanted to give this a try and was unsure of the various results, including messiness. I would now love to give this a try on a new 4 foot tree I just finished putting lights on. Your tree looks fabulous! I just found your site through Pinterest and I LOVE it!!! 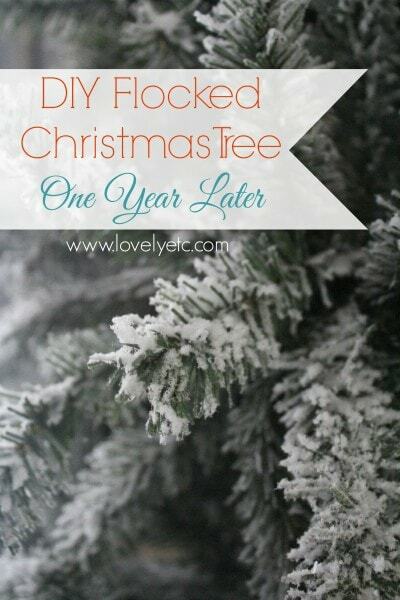 I can’t wait to flock my old Christmas tree!! Your tree looks so beautiful! The flocking made a huge difference. I, too, have always wanted to do this on my tree and maybe even the greenery for my bannister-excited to give it a try! Becki, great question. I thin it might be tricky to remove all of the flocking, but you could definitely get most of it off with a bit of work. If you brushed at it with a broom and gave it a really good shaking, you could probably knock a lot of it off. I don’t know if water would help or hurt though since the adhesive is activated with water. I want to flick a large wreath for the peak of the house. In NW FL will the rain turn it into a goopy mess? Great question Donna! I don’t have experience with this, but I wouldn’t recommend this flocking for use outdoors. There is definitely a chance that rain or even very strong winds could ruin it. I just love your tree and how it came out. What type of tree is this one you put the flock on? Thank you so much Lori! I don’t know exactly what tree it is because we’ve had this tree for quite a few years now. It was a pretty basic artificial pine Christmas tree though. Amanda, that’s a great idea. I’ll have to look into it! Thanks for the info. I ordered a 5lb box and it should arrive today. My tree is 10 ft (I think… or maybe 12). I’m definitely going to work in the garage but I seriously considered just hosing it down first instead of spraying. Do you thing this would work? It’s not pre-lit and it is in 3 sections. However, I wrap lights up and down each branch every year and I’m now considering lighting it before flocking. If so, I guess I couldn’t hose it down anyway. Thoughts on hosing or pre-lighting? PS: I have a few pre-lit trees as well and I also cut the non-working lights off with wire cutters. You’re not crazy! Thanks for the assurance I’m not crazy! I love the idea of pre-lit trees but the lights just don’t last long. Or at least the old ones didn’t. You can really do the flock or the lights first. If it was me, I would probably do the lights first just to get them out of the way. I wrap my lights in around each branch too and it takes way longer to do that than the flock. But that’s only if you are ok with your lights getting flocked too. If you decide to do the flock first, you could definitely use a hose with a sprayer set on a mist setting. That would go super fast! Sorry I’m not more definitive but really you can do it whichever way you prefer. I’m really excited to try this product and am very appreciative of your post! I custom decorate 4′ or smaller tree with stems, ribbon and ornaments securely wired into the tree (florist wire). I chose 4′ or smaller as they are portable and easily stored (covered) until next season. No need to redecorate each year! I’ve wanted to use a flocked tree but their cost was prohibitive. Not any longer!! Thank you! Kimberly, your trees sound beautiful! I hope you love the flocking as much as I do! It’s that time of the year again! I absolutely love your tree and the tutorial, I wanted to do this so bad, however there are no flocking materials available here in Australia. I decodes to order a packet of fake snow instead, its just a dry powder with no adhesive added to it. It expands with water. I am going to use the same method, except I will add some glue to the water spray and keep my fingers crossed it will stick. Thank you for inspiring me! Good luck Bridget! I really hope it works well for you! Your tree is absolutely beautiful! I want to try doing mine this year, but I’m worried how it’ll hold up stored. Specifically…does the white flock turn yellow? Hi Kelli! The white flock does not turn yellow over time. We have been using this same tree for five years and I have added more flocking a few times but the original flocking still looks good as well. So just to be sure, I can flock my pre lit tree without ruining the lights? Yes, you can. Just don’t plug them in until the tree and flocking are completely dry – I would wait at least 24-48 hours. Any ideas if there is anything that can be sprayed on the tree to keep the flocking from coming off and making a mess? Thanks. Carol, this is a good question. I have wondered about this myself. You could try using a matte spray sealer but I feel like it might just flatten the fluffy flocking. I did try using spray adhesive on a mini Christmas tree to apply the flocking instead of water to see if that made a difference. It turned out that plain water worked just as well though.